This spring has seen a new wave of cities & communities joining the Open & Agile Smart Cities network (OASC). The digital city network now counts 132 member cities organised in 26 national and regional chapters. OASC and its members have the ambition to build a global market for smart city data and services from the demand side and based on the needs of cities and communities. Following an election earlier this year, OASC aims to achieve a smart city market for data and services based on open, common, and minimal standards – the so-called OASC Minimal Interoperability Mechanisms (MIMs). Bordeaux, located in southwestern France and the heart of the famous French wine region, has joined the network after successfully becoming part of the SynchroniCity project through the project’s open call. SynchroniCity is funded with €20 million under the European Union’s Horizon 2020 programme to drive the development and implementation of the OASC Minimal Interoperability Mechanisms. By bringing together insights from SynchroniCity, but also from the EU Lighthouse project Sharing Cities and as chair of the Working Group on Standards & Interoperability of the EUROCITIES Knowledge Society Forum, Bordeaux aims to contribute to the further development of the OASC Minimal Interoperability Mechanisms. With similar ambitions, the city of Wolfsburg, has joined OASC as part of the city’s recently launched #WolfsburgDigital strategy. At the core of #WolfsburgDigital is the ambition to transform Wolfsburg into a leading digital city based on open standards and focusing on co-creation of smart city services with its citizens and innovation ecosystem. The municipality of Novo Mesto, located in southeastern Slovenia, close to the border with Croatia, has become the third city to join OASC Slovenia. Traditionally considered the economic and cultural centre of the Lower Carniola region, Novo Mesto has a particular interest in sustainable energy management and driving the implementation of innovative solutions. It has recently implemented a smart energy management system and is now supporting the OASC approach to create a smart city market based on open standards. At the same time, OASC Sweden has been brought to life by the cities Orebrö and Skellefteå. The Swedish chapter aims at bringing together Swedish cities around a common framework as they participate across national initiatives such as national strategic innovation programmes, Viable Cities and IoT-Sweden, and on a European level via EUROCITIES. OASC Sweden is officially kicking off on 23 April in Stockholm. Registration is still open here. Already in March 2019, OASC Romania was established to foster city cooperation on a national level and to support the goals of Open & Agile Smart Cities. The Mayors and Smart City Advisors of the three Romanian Cities Botosani, Iasi, and Suceava came together to officially launch OASC Romania together with Dr Davor Meersman, CEO of OASC, at the CIP Forum 2019. The CIP Forum is a high-level cyber security conference organised by Romanian Research Institute ICI that took place on 25-28 March 2019 in Bucharest. 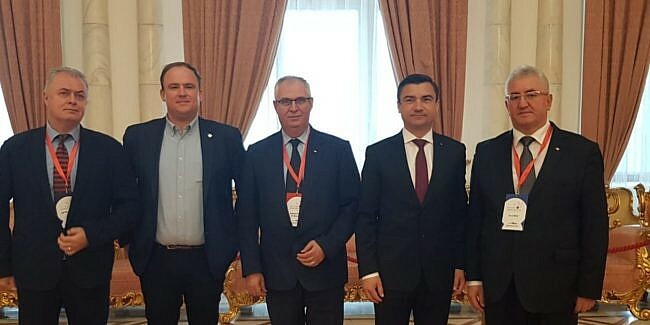 CEO Dr Davor Meersman (2nd, left) together with the Mayors of Botosani, Catalin Flutur, (left), Iasi, Mihai Chirica, (2nd, right) and Suceava, Ion Lungu (right).